P0075 INT/V TIM V/CIR-B1 (Intake valve control solenoid circuit bank 1) An improper voltage is sent to the ECM through intake valve timing control solenoid valve. If DTC Confirmation Procedure has been previously conducted, always perform the following procedure before conducting the next test. Start engine and let it idle for 5 seconds. Is 1st trip DTC detected? YES >> Proceed to EC-180, "Diagnosis Procedure". Disconnect intake valve timing (IVT) control solenoid valve harness connector. Check the voltage between intake valve timing control solenoid valve harness connector and ground. Check the continuity between IVT control solenoid valve harness connector and IPDM E/R harness connector. Is the inspection result normal? YES >> Perform the trouble diagnosis for power supply circuit. Check the continuity between IVT control solenoid valve harness connector and ECM harness connector. Check the intake valve timing control solenoid valve. Refer to EC-181, "Component Inspection (IVT Control Solenoid Valve)". NO >> Replace intake valve timing control solenoid valve. Refer to EM-48, "Exploded View". Disconnect intake valve timing control solenoid valve harness connector. Check resistance between intake valve timing control solenoid valve terminals as per the following. Remove intake valve timing control solenoid valve. Refer to EM-48, "Exploded View". Provide 12 V DC between intake valve timing control solenoid valve terminals 1 and 2, and then interrupt it. 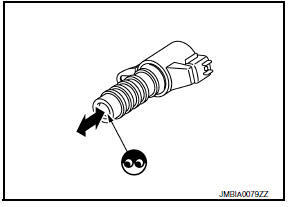 Make sure that the plunger moves as shown in the figure. Do not apply 12 V DC continuously for 5 seconds or more. Doing so may result in damage to the coil in intake valve timing control solenoid valve. Always replace O-ring when intake valve timing control solenoid valve is removed.